The European Organization for Cooperation in Cancer Prevention Studies (ECP) was established in 1981 to promote collaboration between scientists working in the various European countries on cancer causation and prevention. In order to achieve this aim, various working group- to deal with specific cancers or aspects of cancer aetiology, and to explore the opportunities for advances on a cooperative European basis - were established. It was also decided to hold annual symposia to draw general attention to fields in which there seemed to be many opportunities for progress in matters of prevention. These symposia have been devoted to themes of high priority to cancer prevention: "Tobacco and Cancer" (1983), "Hormones and Sexual Factors in Human Cancer Aetiology" (1984), "Diet and Human Carcinogenesis" (1985), "Concepts and Theories in Carcinogenesis" (1986)," Preventive Strategies for Cancer related to Immune Deficiencies" (1987), "Gastric Carcinogenesis" (1988), and "Breast, Ovarian and Endometrial Cancer: Aetiological and Epidemiological Relationships" (1989). 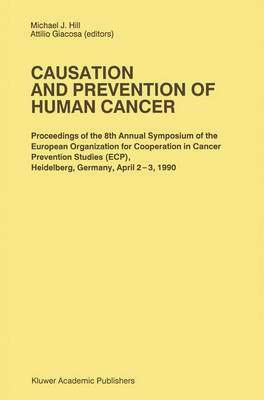 This volume contains the proceedings of the 1990 ECP symposium held in Heidelberg, FRG, at the Deutsches Krebsforschungszentrum (DKFZ), on April 2-3 on "Causation and Prevention of Human Cancer". We are indebted to the speakers for their contribution during the symposium and for their prompt submission of manuscripts. We are grateful to the sponsors, SmithKline Diagnostics and Rohm Pharma. Our special thanks go to Dr M.C. stanei-Gueur for preparing and typing the camera forms of all manuscripts.